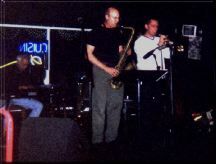 The Miller/Keller group: Ron, Gary, Bill Pace and John Yarling played a weekly gig at the Hollywood, Fl. jazz club owned by UM grad Stan Waldman named One Night Stan's for nearly 3 years from ca 1099 to 2001. There was some burning and fun times with the playing and the hang. The Wall features Filipe LaMoglia; The Lieb features Phil Doyle; Designor Musik, a bunch of sitters in; Blues For the High Priest, the usual Keller/Miller band members. Designor is pretty funky and loose, but still freaky, fun and good.